Never thought I would find any extra information on my g.g.grandfather Thomas Smith b.abt.1809 Ilkeston. With the dreaded Smith surname, I had given up all hope of finding any other details, except those from the census. These show that he married a Mary Ann b.abt.1812 Nottingham and went on to be a farmer and boatman at Little Hallam Hall. Anyway from your census notes, I see parents may have been Richard Smith & Mary Keetley and wife Mary Ann Bainbridge (Bembridge). Thomas Smith, Baptism Ilkeston – April 25th.1809 of Richard and Mary and his marriage: 30 May 1830, Saint Nicholas,Nottingham. to Mary Ann Bainbridge. Wonder if you have any extra data in your records or sources to confirm any of this? Know it is difficult and even if I managed to get the marriage document, don’t think it would help. Would seem Thomas Smith and Mary Ann had six children, of these ……. Thomas Smith died in 1886 ……..
An inquest was held last night at the Bull’s Head, Little Hallam, Ilkeston, before Mr. W.H. Whiston, coroner, concerning the death of Thomas Smith. lived at Little Hallam Hall. He had not been in good health for some time. On the 22nd. September deceased run a rusty nail into back of his hand. increased in severity every day. On the Monday following they sent for Dr. Carroll, who attended him until his death, which took place on the 1st. October, from mortification of the left arm and leg which supervened. matter formed at the elbow, but he did not open it, as he could see the deceased was sinking. The cause of the death was blood poisoning. The jury returned a verdict in accordance with the medical evidence. I may be able to give you a little more to work with, but no definitive evidence I’m afraid. Richard Smith married Mary Keetley at St Marys on June 16th 1801. The first child of Richard and Mary was Catherine/Kitty Smith, born abt 1802, who married George Hives (son of George and Mary (Goodacre?)) on Dec 23 1824 at St Marys and then went to live at Hose, Leics, (home town of George). Son Thomas Smith was baptised at St Mary’s in 1809. Daughter Ann (the Second) was baptised in 1813 and married John Blunstone, a Trowell farmer, in May 1840, and thereafter lived in Nottingham Road, Stanton by Dale and then Breaston. On the 1861 Census Ann’s niece, Mary Ann Hives (daughter of George and Kitty) is staying with her aunt at Stanton by Dale. Richard Smith died at Stanton by Dale, aged 85, on May 10 1859. He was being cared for by Mary Riley (nee Smith), the wife of lacemaker Thomas Riley. Both Thomas and Mary were born about 1807 in Ilkeston but lived in Harrington St in Nottingham. They had married at St Mary’s in January 1826. They had a daughter Jane born about 1845 in Nottingham. Was Mary Riley (nee Smith) a daughter of Richard? 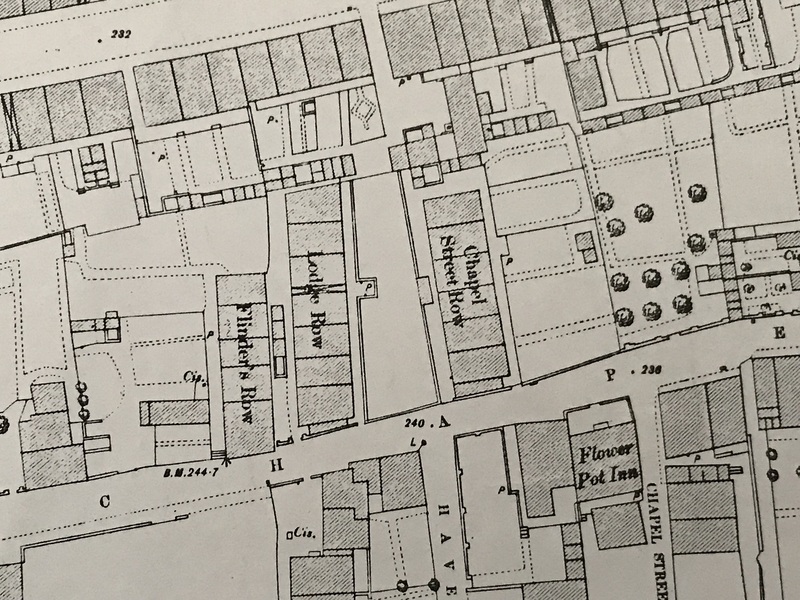 Was Thomas Riley the son of Joseph and Jane (nee Walker) and thus the elder brother of George and Samuel Riley of Station Road? A Thomas Smith (born about 1809) married Mary Ann Bainbridge of Nottingham in 1830, and thereafter lived in Ilkeston where their children were born. They were Ann Elizabeth (1833 – died in infancy), Richard Aram (1839), Mary Ann (1840), Elizabeth Lowe (1842), John Lowe (1844), George (1847).Elijah Aram (1851, died 1852), Herbert (1853, died 1854), Jane (1855). There should be a clue in these names somewhere. As you know Jane married Thomas Carrier. She died in Stanton Rd in August 1898 and Thomas at 66 Stanton Road in August 1914. Thomas Smith died in October 1886 aged 77 and Mary Ann aged 80 in June 1891. They too were buried in the same plot (No 190/2nd class) in Stanton Rd Cemetery in Ilkeston. Thank you for that extra information on the Smith Family. Gives me plenty to go at, so will start digging. Think I will start by obtaining the birth certificate of Elizabeth Lowe Smith 1842, this may confirm the mother as Bainbridge. Interesting, these middle names of Aram and Lowe. I believe I am a relative of George Smith who was hanged at Derby Gaol in 186l. I believe my Gt.Gt. Grandfather Thomas was the brother of Joseph Smith who was murdered by George Smith (his son). George was only 20 at the time. Does anyone have an interest in this line of the Smith family? There may not be any relevance to your Leadbetter families but I made this observation on my website about the seemingly illegal marriage of Hannah Bacroft. “The marriage of a William Smith and Hannah Bacroft (sic) took place on the 4th Sept 1842 in Radford, Notts. William was described as a widower and Hannah as a widow. Hannah’s father, John, being recorded as John Kilson. The marriage took place a few miles from Ilkeston where William and Hannah were probably known and this together with Hannah’s surname being changed to Bacroft (1) and her father to Kilson (2) appears to be to hide the fact that Hannah was still married to Isaiah Beecroft. Although it cannot be proved that this is a bigamous marriage by Hannah nee Tilson the date fits with the Derby Assizes report (see ‘Criminal’ entry). I am descended from Henry Smith, the son of William and Hannah who was born in March 1843 which would account for the marriage in Sept 1842! More information on many Ilkeston families can be found athttp://www.ennever.com. Do you know where I could obtain more info on him and also Annie Eyre and her mother Emma Eyre? Also what would of happened to the cast of Smith’s head by Mr. Barton, sculptor of Derby ? The obvious sources of information are census returns, parish registers, birth/death/marriage registrations. The trial of George was covered in many newspapers throughout the country with, as you would expect, most detail in the more local papers like the Ilkeston Pioneer and Ilkeston Leader (copies in Ilkeston Library), the Derby Mercury and Nottinghamshire Guardian (available online) and through findmypast etc. if you are a subscriber. I don’t know if I can add a lot more to what I have put on the site. George was born on April 16th 1841, the eldest son and third child of Joseph and Harriet (nee Clay) who went on to have at least 7 children. Emma married on Sep 20th 1868 at St Marys Church, to John Mitchell, son of John (and Martha (nee Bamford)?) .. they had at least 5 children. Annie lived with them, known at times as Annie Eyre Mitchell. The family ended up at Victoria St in Ilkeston where Emma died (at No 9) on Sep 3rd 1884, aged 41. Annie had at least two illegitimate children .. an unnamed son born on Sep 23rd 1879 in Chapel St, who died three weeks later, and Eliza Ann Eyre born on Mar 17th 1882 at 1 Carr St, Ilkeston. On Dec 24 1882 she married coalminer Henry Grainger, son of Thomas and Elizabeth (nee Henshaw) and then had at least 9 other children. By the end of the century they were at Eyres Gardens in Ilkeston. I believe Annie died in 1936, aged 75. George Smith may have had a second child with Ellen Cox of Belton, Leics. She was the daughter of Edward and Mary (nee Waters) and had a daughter Sarah Ann born in 1861. I can’t help with the ‘resting place’ of George’s death mask … there may be others ‘out there’ who could help with this. There is a website (www.derbygaol.com) which you could contact. It may not have a definitive answer to your question but might be able to suggest possible leads, better than I could? If there are any other specific details about George, his family, or the Eyres that I might help you with, do please ask again. I would be very interested if you get additional information from elsewhere. Thank you so much for the reply regarding George Smith. I only knew of 4 children being born to Joseph and Harriett Smith; Sarah, George, Henry and Edward, (Edward went on to be Mayor of Ilkeston and he appears to have an impressive head stone in St Marys Church Yard) I now have 3 more children to follow/find. The marriage of Joseph to his second wife only lasted 22 weeks, so I think there would have been no more children born to Joseph after the death of Harriett. I have no date of birth for Joseph and do not know what age he was upon his death, but think he had at least one brother, Thomas. My great grandmother was Annie Eyre and my mother knew Eliza Ann (her auntie). The only other aunties and uncles she knew were; Sam, Jimmy, John, Henry, Alf and Lillian, my grandma was the youngest and her name was Annie, she died aged 94 in 1998. The three children you are missing are Maria (Feb 3rd 1839-Dec 27th 1840, aged 1y 11m), Catherine (Mar 24th 1846-Oct 25th 1854, aged 8, and on the 1851 census, died of typhus), Ruth Maria (Jun 11th 1853- Aug 25th 1853). Joseph was baptised on Dec 10th 1815 at St Mary’s and at his death in 1861 his age was recorded as 46. Thanks for the information on your family which I will put on the site (After George) If you could tell me a little more about your great grandmother Annie, Eliza Annie and what happened to her, and the Grainger aunts and uncles, I would appreciate that if you feel able. No rush. The contact address is dave.johnson@oldilkeston.co.uk. ps I noticed someone was asking about Eyres. Percy married Martha Eyres is that anything to do with the person they are looking for? PS There are a few further references to headmaster Frank Miller Smith on the newspapers of the 1930’s and 1940’s. Steven Henman wrote (Dec 29th 2018)….